Dominical Fishing Charters has several fishing options such as the Offshore Fishing, or sometimes called Deep Sea Fishing and Inshore Fishing. Perhaps you are staying in a Villa or Hotel in the Dominical area and you are looking for a fishing charter adventure, then you have come to the right place. Enjoy your sport fishing for both offshore and inshore near Dominical, in the Quepos Marina which is just a 30 minute drive away. 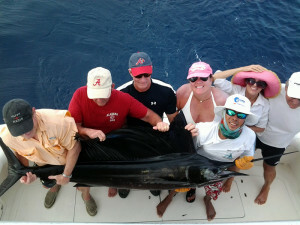 Our two most popular are the full day offshore charter and the inshore half day charter. The offshore fishing charter is the ideal trip to target Sailfish, Dorado, and Marlin. The inshore fishing is a great charter to target Rooster Fish, Jack Crevalle, Spanish Mackerel, and Snook. The bottom fishing is where you may find Red Snapper, Grouper, Rabbit Fish and Devil Fish. It is important to identify the species of fish that you are targeting when you are selecting your fishing charter. The fishing here in Costa Rica is good year around and offers a wide variety of species in both the offshore charters and inshore charters. There is a good reason why so many people from all over the world visit this Amazing Fishing Paradise. Dominical is about 30 minutes away from Quepos. We own a 15 passenger Ford Van, so we can arrange transportation for you and your group at a very reasonable cost. If you are in Dominical and are looking for that Perfect Fishing Adventure, then look no further then Reel In Luxury Sport Fishing! Both of our Luxury Fishing Vessels are fully equipped to do all types of fishing charters. Looking to fish for Big Game Fish? 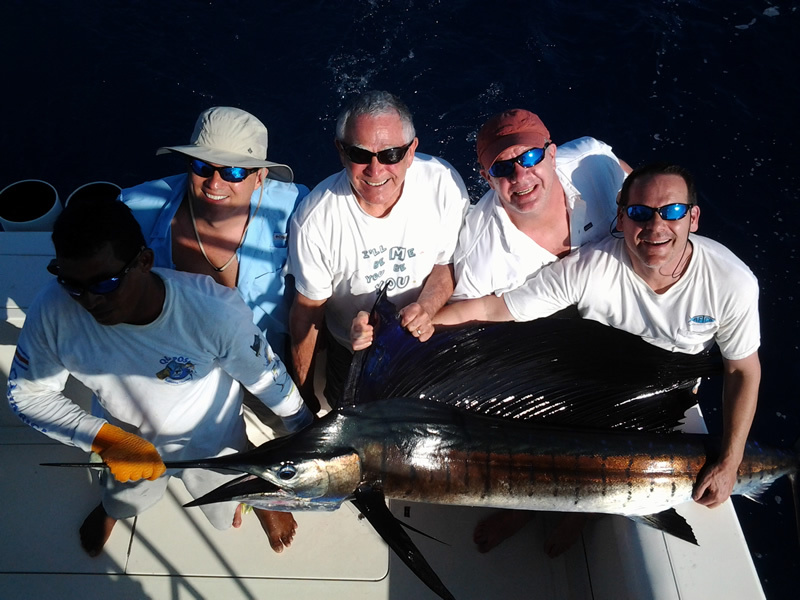 The offshore fishing charter is the ideal fishing trip for those anglers targeting Sailfish, Dorado, Marlin, Tuna and an occasional Wahoo. Interested in “Reeling In” a Rooster Fish? The inshore fishing charter will provide you with the best chance to fish the inshore species such as Rooster Fish, Snook, Spanish Mackerel, and Jack Crevalle. The Bottom Fishing Charter is great for those anglers seeking to bring home some fish to eat such as Red Snapper and Grouper. Dominical, near Quepos, is a popular sport fishing destination. However, the “dirty little secret” is that most sport fishing boats out of Dominical, head south to the waters off Quepos.There’s a good reason that they come to Quepos; That’s where the fish are!!!!! Why pay the higher price for a boat out of Dominical, when you can save money, and time out of a Marina closer to where the fish are? Reel In Luxury Sport Fishing has a beautiful, air conditioned 15 passenger Van, and we are happy to provide transportation to and from Dominical, at a cost much less than the additional cost of hiring a charter out of Dominical. And, you can get to the fish much faster, so that you’ll have a full day of fishing in prime waters.